When we were home for Thanksgiving, my father-in-law made it clear that he was anxious for Christmas…and buckeyes. While I can’t say I loved our years spent as Ohio residents, I grew very fond of the beloved peanut butter balls. The buckeye state has one thing going on, that’s for sure. Problem is, buckeyes are very time-consuming to make. Between Mr. Prevention and my father-in-law a double or triple batch is required. I started putting the bug in Mr. P’s ear that I wanted some help this year and yesterday, I got that help. To get his help yesterday we bargained….compromised, if you will. He helped with buckeye making and I agreed to fondue for dinner. I was a bit surprised that he was so adamant on fondue since this recipe, which we enjoyed last week, was filled with cheesy goodness. 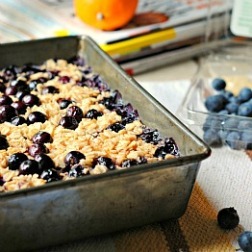 Despite there being no photo in Bon Appetit for the recipe, the title caught my eye immediately. I wasn’t scared off by the ingredient list and the preparation was easy breezy. I made a few substitutions and served this up. We both loved it and it is lighter than fondue…and traditional saganaki. The tomatoes and wine add so much flavor. This one-pot meal is a bit of a splurge that you will definitely want to make again…and again…and again. Heat oil in a medium heavy skillet or cast iron skillet over medium-low heat. Add scallions and fennel; cook, stirring often, until soft, about 3 minutes. Add garlic and saute 30 seconds, or until fragrant. Add tomatoes and cook, stirring occasionally, until reduced by half, 4-6 minutes. 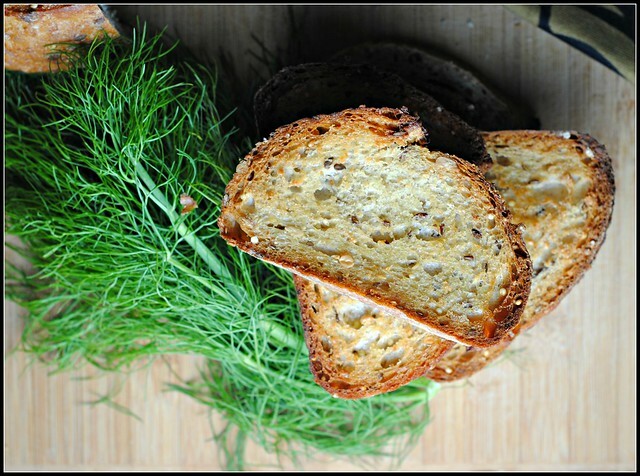 Remove from heat; add wine, broth, parsley, dill, oregano, salt and pepper. Cook over medium-high heat, stirring often, until tomato mixture is reduced by one-third, about 5 minutes. Reduce heat to medium. Add shrimp to skillet, arranging around edges. Place block of feta in center of skillet. Cover and simmer until shrimp are cooked through and feta is warm, 4-6 minutes. Remove skillet from heat. 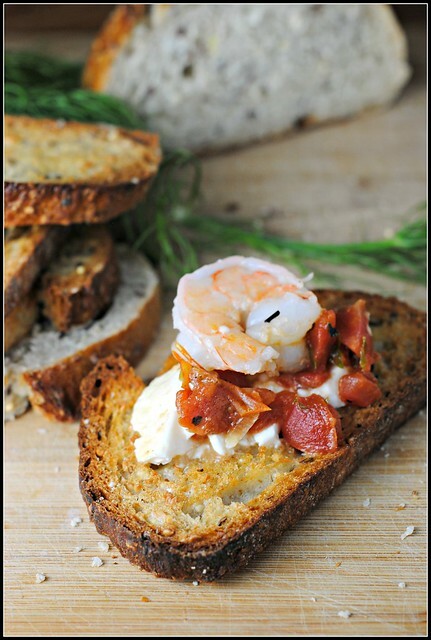 Transfer shrimp and feta to a large shallow bowl, if desired, or serve from the skillet at the table with crusty bread. Result: What a fun meal…and a bit of a splurge. 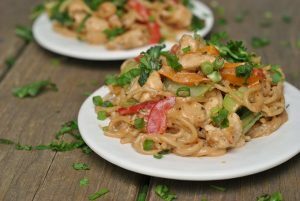 There’s nothing topping any nutritional charts here, but this meal is a simple recipe that is perfect to share for a small group or between a couple. I grew up with saganaki and feta is a great substitute for halloumi, which is grilling cheese that is much more difficult to find in stores. 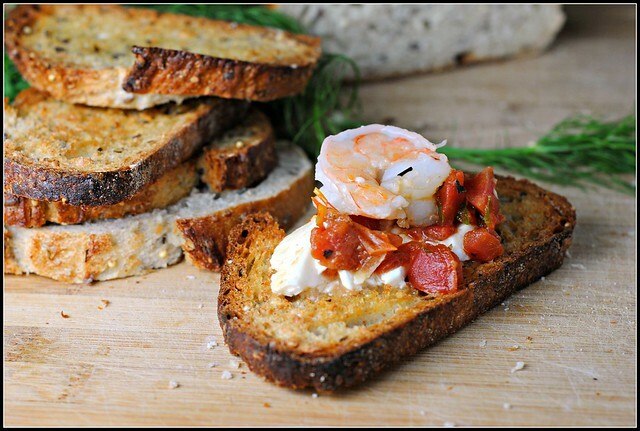 Serve this with a few slices of toasted baguette and this “splurge” meal will still come in under 500 calories per serving. You’ll love it…promise! Is that Whole Foods seeduction bread? Love that stuff! It’s funny, I don’t think I’ve had a buckeye since we moved from Pennsylvania 17 years ago! This looks soo good. 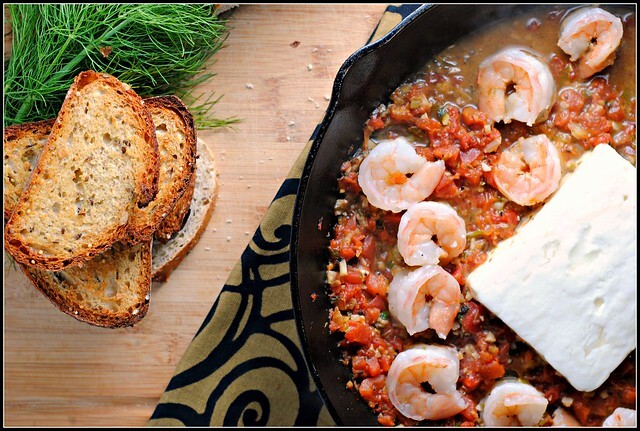 I’m not familiar with saganaki nor with pairing feta with shrimp, but I’d love to try it!